The first chapter of the show opened with classical vignettes featuring Les Sylphides also known as Chopiniana in Russia, a romantic white ballet that depicts a lone danseur (The Poet) surrounded by his muses—white-clad sylphs or air spirits dancing in the moonlight. While there is no plot, its lingering music by Frederic Chopin and lyrical choreography by Michael Fokine evoke the illusion of ethereal weightlessness which characterized the romantic era of ballet where technique is the focal point, especially the intricate pointe work of ballerinas. Other classical vignettes included Pas De Action and Diane et Acteon. From this trance-like ambience, the second chapter of the show highlights the thrilling contemporary number of “The Winding Road” set to the tune of The Beatles. 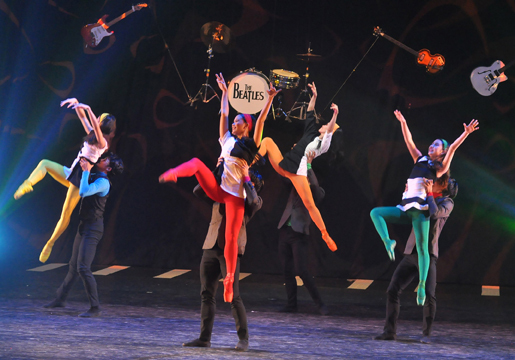 Choreographed by Martin Lawrance, both young and old surely enjoyed The Beatles hits such as “I Saw Her Standing There,” “Here, There and Everywhere,” “Something,” “The Long and Winding Road,” and “She Loves You,” to name a few. Ballet Manila is The Philippines’ Premiere Classical Dance Company. Under the leadership of Lisa Macuja-Elizalde, Ballet Manila has brought the magic of classical ballet to the farthest-flung regions of the country, as well as the important ballet capitals of the world.